February is Teen Dating Violence Awareness Month, and more specifically, February 11-15 is Respect Week. I consider domestic violence and dating violence to be pressing public health issues, so I wanted to provide some information. Dating violence involves abusive behaviors used to exert power or control over a dating partner and often becomes a pattern over time. According to the Teen Dating Violence Awareness Month website, "Any teen or young adult can experience violence, abuse or unhealthy behaviors in their dating relationships. A relationship may be serious or casual, monogamous or not, short-term or long-term. Dating abuse does not discriminate – it does not see gender, sexual identity, economic status, ethnicity or religious preference." Dating violence can include physical abuse, verbal/emotional abuse (threats, humiliation, isolation, stalking, monitoring), or sexual abuse. In recent years the use of the internet, phone, or other technology to harass or monitor an individual has also become a major concern, as described in the stories here and here. Example of cyber stalking. Carla Franklin is not a teen, but this video gives an example of what may occur. Dating violence can happen at any age, but February focuses on teenagers, because according to the U.S. Department of Justice, young women between the ages of 16 and 24 experience the highest levels of partner violence. Research shows that one in three teens in the U.S. is a victim of physical, verbal, or emotional abuse, and by college, one in six women report having been sexually abused in a dating relationship. Chances are, you know someone who has been in an abusive relationship (although you may not know their story, since many victims do not tell others of their abuse). Various studies have also shown that dating violence makes teens more likely to become pregnant, contract an STD, develop an eating disorder, engage in substance abuse, or commit suicide at some point in their lives. It is critical, therefore, to prevent violence from happening and also to engage in the most helpful way with teens who have experienced violence. If you do know someone in an abusive relationship, tell them you are concerned for their safety. It is important to listen non-judgmentally to keep the lines of communication open with this person. You can help the person recognize the abuse, reiterate that the person is not alone, let him or her know that they do not deserve the abuse, focus on strengths, and support the individual emotionally. But his or her decision to end the relationship is usually outside of your control. If you engage in a direct confrontation with the abuser, you may leave a difficult or dangerous situation for your friend when you leave, so be careful regarding such interactions. Furthermore, it is common for an abuser to attempt to isolate his or her partner from friends and family, so it is important that your friend know you will be there whenever he or she wants to talk, even if your friend has not been in contact for an extended period. If the friend does ultimately end the relationship, it is crucial to continue the support; it is common for individuals to return to abusive relationships multiple times before ending things for good, so having friends to encourage and uplift the individual after a breakup can make a big difference. For more specific advice on your situation, consider calling the National Domestic Violence Hotline at 1-800-799-SAFE. As a parent of a minor child in an abusive relationship, you may have more control over the situation. At the same time, there will also be many instances when you are not with your child (such as at their school, where the abuser may also attend), and it is important that they feel free to talk to you about what is going on during those times that you are not together. If you find yourself in this situation as a parent, please call the National Dating Abuse Helpline or the National Domestic Violence Hotline for advice about what authorities to contact and how to talk to your teen. For additional facts about dating violence, check out the Clothesline Project or the Teen Dating Violence Awareness Month website. So how can you help right now? One quick and easy way to raise awareness is to wear orange on February 11 in support of Respect Week. Be sure to talk to your friends, family, coworkers, and those you meet that day about why you are wearing this eye-catching color: "Love is Respect!" Then continue advocating and raising awareness other days of the year! Know the warning signs of abuse. This is especially important as a friend or parent of a teen. Read about some red-flag behaviors you may experience in a relationship here or here and symptoms you may notice as a friend or family member of a victim here. 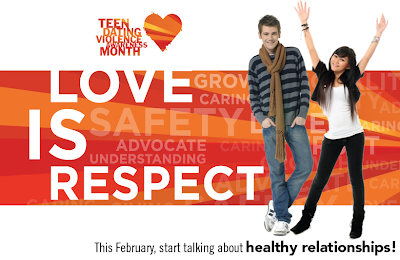 Talk to your teen and even pre-teen children about dating violence. In an age-appropriate manner, talk to them about what makes a good partner, share the warning signs of an abusive partner, and let them know you are there to talk, help, and support them through the joys and trials of dating. Consider mentoring a teen or pre-teen. Having a safe person to talk to who is not a parent may help teens make better dating choices, and you can be a trusted resource if they do need to seek help. This is especially important for youth who are at higher risk for entering abusive relationships or even becoming abusers themselves. One organization I highly recommend in my area is CASA of San Mateo. Your area may have its own CASA program, a Boys & Girls Club, or other mentoring opportunities. If you or someone you know has questions about what to do in an abusive relationship, or if you are wondering whether a relationship is abusive, contact the National Dating Abuse Helpline by texting "Loveis" to 77054 or by calling 1-866-331-9474. You can speak to a youth peer advocate who can offer support, information, and advocacy. For a more extensive list of organizations dealing with domestic violence and abuse, check out this site. Consider contacting any one of these organizations to seek help, to volunteer your time, or to donate funds for prevention or victim services.